On this fourth Wednesday of September, the dictionary project is pleased to host the musings of the inspired and inspiring Andrea Scher. I first became aware of Andrea’s creative work–among her many creative gifts, she is an amazing photographer and thoughtful writer–through her blog Superhero Journal, which has recently been transformed into the gorgeous Superhero Life. Her work is honest, compassionate, and rooted in inquiry into the big life questions we all face. Through her creativity, Andrea invites others to embrace their own artist selves. Enjoy! In college, after a long game of Balderdash over many glasses of red wine, my friends and I started asking the dictionary questions and randomly pointing to words in response. “What should be the name of my first born child?” Drivel. “What is the meaning of life?” Nothing. And then, we started to get creeped out. As we passed the dictionary around, we started getting more and more accurate responses. My friend Laura, the most woo-woo in the room, asked, “Who is sending us these messages?” She got the word, magpie. We thought this was charming, a little bird whispering in our ear. We later discovered that in Native American folklore, the magpie is the messenger between the two worlds…. I have been asking the dictionary big questions ever since. When people add the suffix “gasm” to other, otherwise totally harmless words. 4. What word has been your muse? 5. What word feels like coming home? I love Yiddish words in general, but this one feels like home. I heard it for the first time in my twenties when my first-ever Jewish friend told me, “Don’t forget your schmatta!” (little sweater) Every time I hear that word or say it myself I feel like I belong to something bigger. Something bigger than religion or culture, a kind of belonging that is everyday and homespun. Sze·chwan (ˈsech-ˌwän; Chin. ˈsooch-ˌwän), n. a province of central China: area, 156,675 sq. mi. ; pop., 47,108,000 (est. 1947); capital, Chengtu; chief city, Chungking. We are Jewish and therefore spent a lot of time at Chinese restaurants on Christmas. My parents ordered the same thing every time—cashew chicken, spring rolls (extra crisp) and Mongolian beef. For many years, I didn’t know there were any other dishes. Or menus at Chinese restaurants. da·do (ˈdādō), n. [pl. DADOES (-dōz)], [It., a die, die-shaped part of pedestal, hence pedestal < L. datum, a die, lit., what is given; see DATE], 1. part of a pedestal between the cap and the base. 2. the lower part of the wall of a room if decorated differently from the upper part, as with panels or an ornamental order. Dado is what my boys sometimes call my husband. Dada. Dado. cro·chet (krō-ˈshā), n. [Fr., small hook; see CROTCHET], a kind of knitting done with one hooked needle. v.t. & v.i. [CROCHETED (-shād’), CROCHETING], to knit with such a needle. When I was about ten I became obsessed with crocheting granny squares. Trouble is I never figured out how to weave them together into a blanket, so I had just had an ever-growing collection of squares accumulating in the closet. This is when You Tube how–to videos would have come in handy. ground (ground), n. [ME. grounde, grund; AS. Grund, sea bottom, etc. (cf. GROUND SWELL); akin to G. grund; ? IE> *ghren-to, what is touched in passing over < base *gren-, to rub against, etc. ; cf. GRIND], 1. a) originally, the lowest part, base, or bottom of anything. b) the bottom of the sea. 2. the solid surface of the earth. 3. the soil of the earth; earth; land: as, he tills the ground. 4. any particular piece of land; especially, one set aside for a specified purpose: as, a hunting ground. 5. any particular area of reference, discussion, work, etc. ; topic; subject: as, let us go over the ground again. 6. the distance to a goal, objective, position, etc. 7. basis; foundation; groundwork. 8. often pl. the logical basis of a conclusion, action, etc. ; valid reason, motive, or cause. 9. the background or surface over which other parts are spread or laid, as the main surface of a painting. 10. in electricity, the connection of an electrical conductor with the ground: abbreviated grd. See also grounds. adj. 1. of, on, or near the ground. 2. to cause (a ship, etc.) to run aground. 3. to found on a firm basis; establish. 4. to base (a claim, argument, etc.) on: as, ground your claims on fact. 5. to instruct (a person) in the elements or first principles of. 6. to provide with a background. 7. in aviation, to cause to remain on the ground; keep from flying: as, the plane was grounded by bad weather. 8. in electricity, to connect (an electrical conductor) with the ground, which becomes part of the circuit. v.i. 1. to strike or fall to the ground. 2. to strike the bottom or run ashore: said of a ship. 3. in baseball, to be put out on a grounder (usually with out). I want to be grounded. I want people to say, “She’s so grounded. I just love being with her.” Instead I am more inclined toward anxious. High strung. Vigilant. I rush to yoga. I shuttle my kids along the sidewalk quickly, for no good reason. I have to remind myself to slow down. I get panic attacks. They crop up mysteriously at times– looking at Google maps, changing a diaper – then, post-attack, I am in for another week of anxiety. Always trying to catch my breath, afraid I’m not getting enough air. Various shades of these symptoms have plagued me for most of my adult life. But I want to be grounded. Actually no, as I write this, I see that it’s not even grounded that I’m after. It’s light. It’s light-hearted. It’s caring a bit less. It’s trusting a bit more. It’s holding it all more lightly. sal·ta·tion (sal-ˈtā-shən, sȯl-), n. [L. saltatio, a dancing, dance < saltatus, pp. of saltare, to leap], 1. a leaping, jumping, or dancing. 2. sudden change, movement, or development, as if by leaping. 3. palpitation or throbbing, as of an artery. 4. in biology, mutation. I have an enormous collection of jumping photos. Somehow, having my subject suspended in mid-air always has a certain magical quality — an air of celebration, of appreciating life, and aliveness. These are things that can feel hard to attain sometimes, but I am always reaching for them. These photos help. 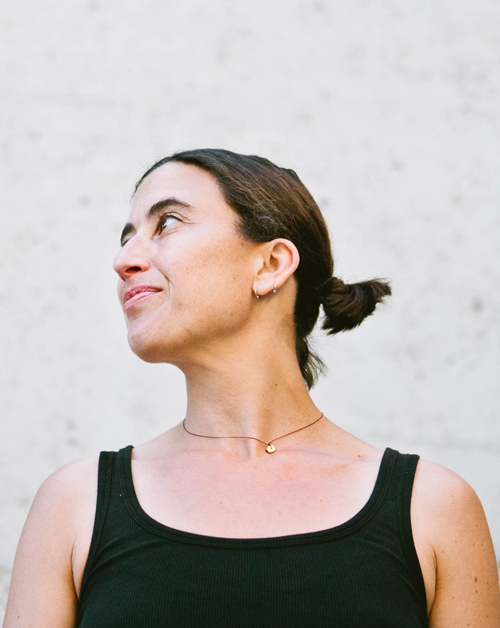 Andrea Scher is an artist, photographer, and life coach. 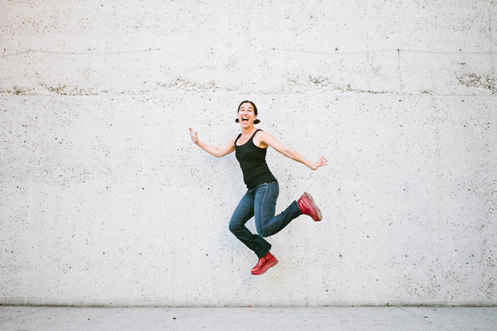 Through her award-winning blog Superhero Journal and e-courses, Mondo Beyondo, Superhero Photo and Cultivating Courage, Andrea will inspire you to find your passions, dream big and say YES to the life you’ve always wanted. Andrea is also a supermom (no capes, just courage) to two adorable boys named Ben and Nico. She is the co-author of a wonderful book called Expressive Photography: The Shutter Sisters Guide to Shooting from the Heart. You mean fourth week of September, I think. This project is a great idea! I love Andrea and I love this style of interview! How interesting!